Are you struggling to find some great Christmas gifts for a 2 year old? Or perhaps it’s a Birthday gift you are in search of. 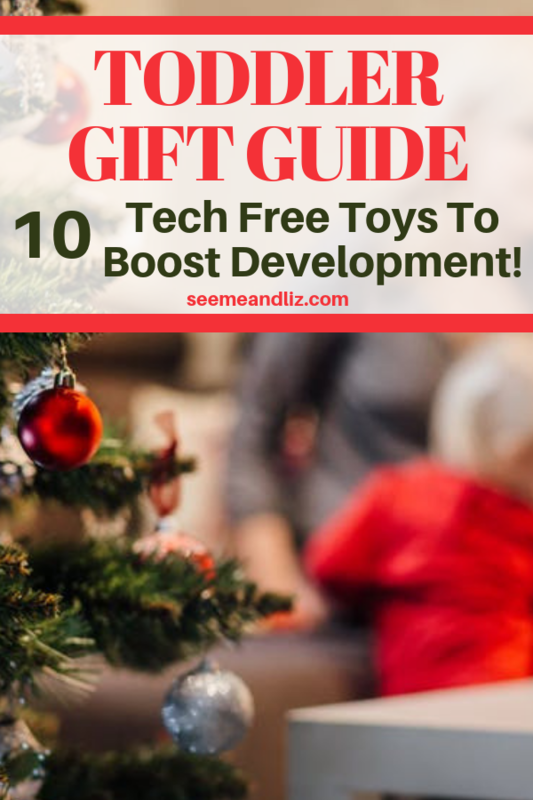 Here is a list of 10 toys that are unique, engaging and of course since they are featured on Seeme & Liz, they will promote speech-language development and learning! And not one is over $100. Actually, most are under $50! It was really tough to narrow down the list to just 10 toys. I came up with this list based on several different criteria that each toy must meet. Majority of the toys are open ended. Provide learning of skills such as prepositions, opposites, color, fine motor, gross motor etc. To learn more about each toy click on the picture/links! The Working Trio Truck set does so many things which is one of the reasons I love this toy! ♥ Great for imaginative play! The trucks can be used individually, or they can tow one another or they can be stacked on top of one another. The truck beds actually move up and down and each truck “drives” through the use of friction (push on the truck and watch it drive). These trucks can go on all kinds of adventures! Each truck bed makes a slightly different sound as does the hook at the front of the trucks. The motor sounds made by the trucks increases in strength with the small truck being the quietest and the large truck being the loudest. This makes the Working Trio Truck set great for children with visual impairments! Play kitchens offer hours of open ended play where each play scenario can change depending on the child’s mood. Play kitchens are also great because they are the one toy that you can easily have for 5+ years. The language and learning possibilities are endless. Do you want a complete list of reasons why every child should have a kids play kitchen? The 8 Best Toy Kitchen Sets Of 2018 Are Here! I choose the Little Tikes Cook n Grow Kitchen for my Top 10 list of Christmas Gifts for 2 Year Old’s because it is one of the only kitchens that will grow with your child. It has 2 height settings making it great for younger children and older children. It is also not an extremely large or pricey kitchen so it will work very well for most families. I won’t go into much detail about this one as I have an entire article dedicated to this toy. Here is why I recommend Castle Marbleworks as the perfect gift for a 2 year old! These aren’t as unique as some of the other suggestions, however, I feel that every child needs blocks! And the Mega Bloks First Builders set is a great set to get started with to encourage free play with blocks. Both of my children got started with this set. Now they are Lego fanatics. These blocks work well for teaching color, size and perseverance. And they are also great for building creativity. If you are wondering why I am not recommending a wooden block set, it’s only because they tend to cause a lot of frustration during the building process for little ones. Mega blocks stick together well and make building less challenging. That being said, you can get magnetic wooden blocks which are great, but they do come with a bigger price tag (for fewer blocks). You can start by building a tower but you can elaborate on it and make a rocket ship. Depending on what you and your child build, you can focus on vocabulary words around that theme. So let’s take the rocket ship as an example. You can work on prepositions such as “up” and “down” and phrases such as “blast off”. Talk to your child about going to the moon. Don’t worry if they don’t fully understand. Exposing your child to varied vocabulary early on will help them with academic success as they get into school. The Melissa and Doug Beginner Pattern Blocks will make a great addition to your list of Christmas gifts for 2 year olds. I highly recommend all Melissa and Doug toys as they are high quality and each one offers many learning experiences. We could probably open a Melissa and Doug store from our house! This set comes with 5 (2 sided) pattern boards and 30 shape pieces. It is wonderful for teaching vocabulary (fish, butterfly, dog, flowers and more). You can also expand on each word. For example, if you are doing the fish puzzle you can talk about how fish live in the water, that they swim, etc. This is also a playful way to introduce basic shapes and colors! This set would make a wonderful gift for an inquisitive 2 year old. The Fisher Price My First Dollhouse offers an excellent introduction into dollhouses and would make the perfect gift for a 2 year old. This is a very basic dollhouse but a 2 year old does not need anything fancy. And it is very affordable (under $50). Many dollhouses start at over $100. I suggest if you are buying a dollhouse for a 2 year old to go with a simple one to make sure that the child likes it. We purchased a $150 wooden Kidkraft dollhouse for my daughter when she was 3 years old. No matter how much I tried to get her to play with it she was not interested. Luckily my son did show interest in the dollhouse when he was about 2 years old. So we did end up getting our money’s worth. Dollhouses are a wonderful toy for learning language. They allow for hours of open ended play and the language opportunities are endless. You can introduce new vocabulary each time you play with it. You can ask your child questions, think of what might happen next in a play scenario and so much more. Another reason I love the Fisher Price My First Dollhouse is because it does not have any sounds. This allows for more imaginative play by the child as they have to come up with the sounds and words to go along with the play. They cannot simply be entertained by pressing buttons. This dollhouse comes with everything you see in the picture. There are add on sets available if your child loves playing with it and would like more characters and furniture. If you would prefer a wooden starter dollhouse, make sure to take a look at the Fold n Go Dollhouse from Melissa & Doug! A tool box makes a wonderful gift for a boy or a girl. As I mentioned above, my daughter had a dollhouse that she was never really interested in. But, she loved her tool set and would play with it for hours. We had a plastic Black and Decker Toolset. It was a bit flimsy and I wish we would have had something wooden instead. The tool box by Wonderworld is made out of rubber wood harvested from a sustainable source. The paints, dyes and lacquers are non-toxic and the glue is formaldehyde free. So no need to get overly worried if the tools get chewed on. Tool sets are great from a language development perspective as you can introduce new vocabulary such as nouns: saw, hammer, wrench, screw driver as well as verbs. You can talk about what you could build or fix. My children loved fixing things with their tool sets. The Wonderworld Little Tool Box is the perfect size for small hands and will also allow for the development of fine motor skills. A barn is a must have from a language and learning perspective! It’s a great way for toddlers to learn about animal names and their accompanying sounds. I selected the Melissa and Doug Fold and Go Wooden Barn because it does not need batteries. And this means that there are no buttons for the child to push to elicit sounds, lights, etc. While there is nothing fundamentally wrong with these types of toys (my children had many), children often get fascinated with the cause and effect aspects of the toy. Also, when there are buttons to be pushed, the level of parent interaction tends to decrease. Aside from learning farm vocabulary, you can focus on other vocabulary words with this toy such as “open” and “close” as the barn door slides open. There is also a fence that the animals can jump over or knock down. In addition, the barn opens up and animals can go into stalls. They can either go on top or on the bottom. These are all vocabulary words that can be targeted! You can purchase additional sets to go with this one. For example, a tractor and farmer. If you are a big Fisher Price fan, the Fisher-Price Little People Animal Friends Farm is another fantastic option! While it does require batteries to activate the sounds, they cane be left out. Watch your child interact with the toy when it does not make sounds! A fishing set is a classic toy for all children. However, there are many to choose from and some are better than others. I love the Learning Resources Pretend and Play Fishing Set because it is more than just a fishing set. I see it as more of a kids costume/role playing set. Your child can be a Fisherman/woman for the day. Everything packs nicely into the tackle box which means it can be taken on camping trips or outings to see the grandparents! With a fishing set, you can talk to your child about fishing vocabulary such as: fishing rod, hook, fish, reel, cast, worm, vest, tackle box, water, “catch a fish”, my turn, your turn, etc. The pretend and play fishing set comes with a magnetic fishing rod, a net, 3 fish ranging from small to large and 3 accompanying worms. This toy provides opportunities for working on size concepts as well. Another wonderful thing about this set is that it can be used in the bath tub or at a water table as well! A 6 page write and wipe activity book is also included (crayons needed to write are not included). *NOTE: The manufacturers recommended age for this toy is 36 months and older. I feel comfortable recommending this set for children 24 months and up. However, the worms are quite small so if your child is still putting objects in his/her mouth, please make sure you are supervising them carefully. Another great toy by Melissa and Doug! I used the Melissa and Doug Snowman Stacker every winter when I was working as a Speech-Language Pathologist! It is lends itself well to introduce winter vocabulary such as snowman, cold, ice, snowballs, scarf, etc. The snowman stacker is made up of 8 wooden pieces. A 2 year old may need a bit of help at first, but they should get the hang of it. Fine motor skills will be strengthened during this activity. You can talk to your child about the size of each snowball with the bottom one being the biggest and the one making up the snowman’s head being the smallest. Parents can also count each snowball as well as how many buttons the snowman has. Sing “Frosty The Snowman” while putting together the Melissa and Doug Snowman Stacker! Christmas Shopping For A Toddler Has Never Been Easier! All of these toys are great from a developmental perspective. Your final decision will most likely come down to your budget. 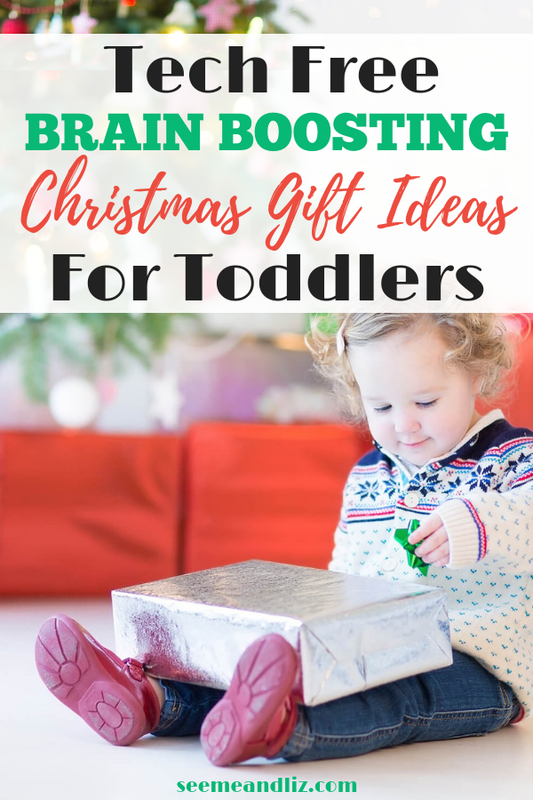 I hope that this list has helped give you some ideas for Christmas gifts for 2 year old’s (or Birthday gifts). If you feel there is another fabulous toy that I have not mentioned please let me know in the comments. Or if you have one of these toys let me know what you and your child thinks of it! Stocking Stuffers Kids Won’t Get Bored Of! Oh, my son would adore that cardboard cottage! So cute. We’ve got a teepee on our Christmas list this year. He loves tents and forts, and I am hoping the teepee will alleviate having sheets strewn across my family room constantly. A teepee would make a great Christmas gift. I love tents, tunnels and forts for children. They have so much fun playing that they don’t even realize that they are learning! It’s a win win for everyone. Be sure to check out my pretend camping toy suggestions that would go well with the teepee. I also provide lots of ideas for how to interact with your child with these toys for natural learning opportunities. Thanks Lauren! Glad you liked the list of gift ideas for toddlers. Open ended toys are the way to go for this age group! I love how you listed 10 very different toys but showed how they can all be used for a child’s development. I had no idea that such simple toys actually helped with a child’s imagination, language development, motor skills, etc. Many parents, myself included, buy toys to keep our children occupied without really thinking about the learning benefits. Thanks again for sharing this great information. I hope other parents have a chance to read this list of Christmas gift ideas for their toddlers. The goal of my website is to show parents that toys do not need to be fancy, pricey or techy in order for their child to learn and grow. There are many wonderful traditional toys that have been around for many years. They will always be necessary for a child’s development. I happened to stumble across your site and after trolling around I had to leave a comment. I think it’s amazing which toys you have chosen to recommend as Christmas gift ideas. These are pretty much the exact toys I used to play at my friends’ places. I grew up on a sailboat so my toys were extremely limited to Lego, that’s it. I look at toys nowadays and they just don’t have the same appeal, lack of imagination and creativity, very much unlike your choices. I also notice the same in children’s cartoons and programming as well. Great site, I am sure your kids are very lucky to have a mother like you. Keep up the great work!! Thanks so much for taking the time to leave me a comment Jair! I love hearing people appreciate these simple toys and that they bring back some wonderful memories for you. Your childhood sounds like quite the adventure…growing up on a sailboat. You probably experienced so many things most children never get to. Great list! These are cool gift ideas for toddlers, I used to buy my nephew when he was younger (he is 7yrs old now) building blocks, kind of similar to the Mega Bloks First Builders set and he loved it! Which I think was amazing because it brought out his creativity and plus it was really fun to just watch him play with those blocks. 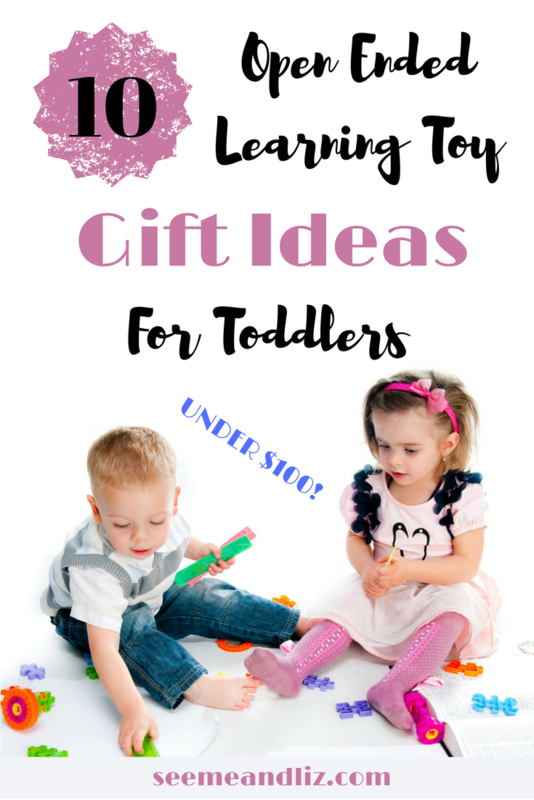 I love lists like this that actually include how to use the toy or what the benefits of the toy are! This makes the gift buying process a lot easier. Thanks Gerry. Blocks are always a great gift because of their simplicity. But they are packed with so many natural learning opportunities. This is why I have carefully selected each of the Christmas gift ideas for 2 year old’s. It’s not about how cool or flashy the toy is. At least, it shouldn’t be. Especially not for toddlers. It’s that time again. Gift buying time. I have a two year old and I have been wondering what would be a good gift for him. I appreciate this post because it takes the thought out of it for me. I like the little toolbox. It’s a great idea and the price is reasonable too. The parts also look safe for both my son and my house (ha ha). Do you have any recommendations for 5 year olds? It sure is Matt! Every child (boy and girl) should have a toolbox. Kids love fixing things and there are so many wonderful learning opportunities a child has access to with a simple wooden toolbox! My kids loved the Magic School Bus science kits when they were 5. You can read my review of those here! Another one of my favorite toys that would be suitable for a 5 year old is a kids play kitchen. The Little Tikes Cook N Grow Kitchen which I have featured in this article would work for a 5 year old, but there are many others to choose from. I have written many articles about those. Here are just a few to get you started! And if this 5 year old is a boy, don’t worry, he should also have access to a pretend kitchen set! This is a great list! You have included what I think personally are some of the best. The Melissa and Doug brand makes a lot of great toys that are for various age groups and they always encourage imagination. My son has gotten numerous toys by them over the years and they are always great quality and a great idea! The other thing that you included that I loved was the pretend kitchen! I think that no matter if you have a son or a daughter they love this toy at that age. Playing “house” or “kitchen” is a great milestone and this toy is amazing for meeting that goal. Great list! Thanks, I am happy to hear that you liked the list of Christmas gifts for 2 year old’s. I completely agree with you, a play kitchen is one of the best toys for children between 2 and 3. I love that it is a toy that can grow with your child and you will have it around for many years. Money well spent! 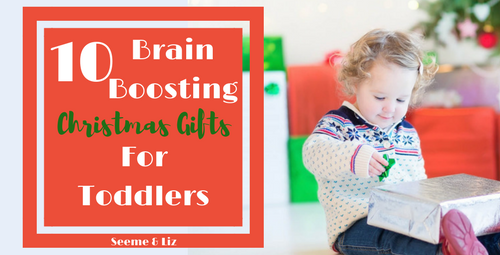 A few of my friends have some younglings recently born, and you’ve got some great ideas for what I might pick up for first Christmas’! I’ve always thought that creativity builds more practical skills, and building sets are fantastic for helping that creativity. You’ve got those and things that will help them learn more about their precious little world that they see, and it’s just amazing. Thank you for this! Hi Tom, thanks for the comment. 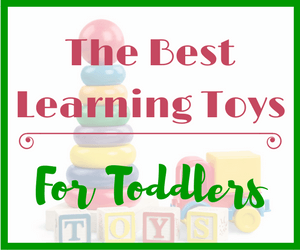 If you are still looking for toys for your friends babies, you should read Best Learning Toys For Babies To Encourage Language Development as it is geared more to children under the age of 2! This is a great site, I don’t even see websites like yours when I look for learning toys for my nieces and nephews. I always want them to learn when they are playing while having fun at the same time. So I really like this site and I would definitely visit this before others to get an idea of the toy I want. Hi, I am happy to hear that you like this site and find it helpful! Please browse around and let me know if you have any questions. I have two toddlers and am starting to love the Melissa and Doug toys. Forget anything digital or that makes a sound. Old fashioned learned blocks are excellent! We have one that’s a bunch of colored pegs in a row, with different shaped blocks that slide onto the pegs in different quantities. My boys can play with it for hours. This is adorable! I quite literally just posted a holiday gift list on my website. Maybe you’ll like it. I like how easy to read your writing is and the good balance between graphics and text in your website. Over all, well done. I am not a mom, but I could definitely use this to get stuff for my cousins, friends siblings, etc. Thanks for the ideas! Thanks Sabrina! I would love to check out your holiday gift list. You can contact me via the “contact us” tab. 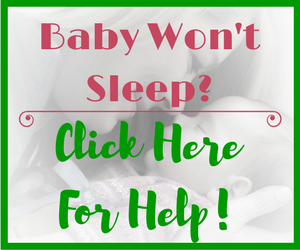 Send me a message with your link! 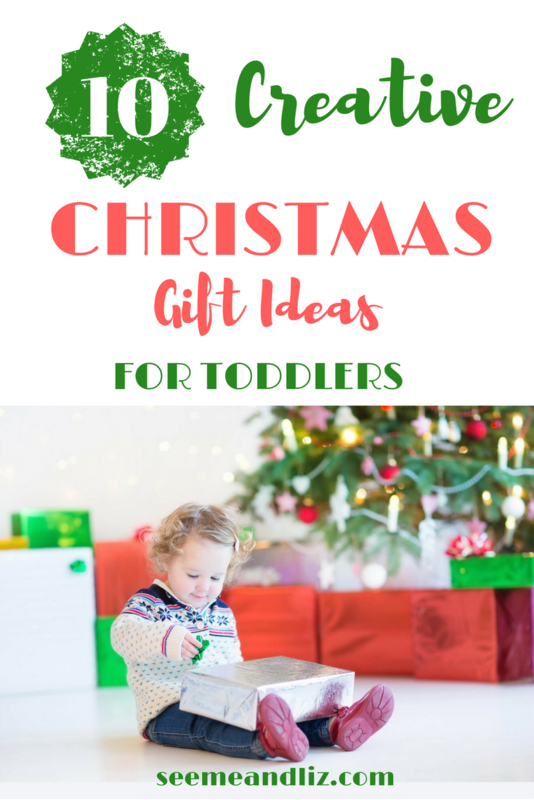 I am happy that you liked the ideas on my Christmas gifts for 2 year old’s list! This really helps my wife and I to select a gift for my nephews birthday. I know your article read, ‘gifts for Christmas,’ but his birthday falls on the 24th December. He is going to be turning three and we are looking at the working trio.He loves cars but I think this will be an excellent opportunity for him to get familiar with trains. Do you have any recommendation on any products that has cars? Just asking out of interest. This guide can really be used for any celebration including a birthday. I just happened to publish it, and since it is close to Christmas, I went with that theme. The Working Trio would make a great gift as it is cars, but like you said, it can also be a train since they hook together. There are so many fun and creative ways to use this toy! As for products that are just cars, I love the car ramps and tracks. Matchbox has a great one. Its called the 4 Level Garage Play Set. The other one I really like (but it is a bit pricier, coming in at $85 – but it is wooden) is the KidKraft Deluxe Garage Set. I really like garage type playsets because boys seem to love them. So much pretend play and language development can happen with these sets. I usually put these in the same category is doll houses, but they seem to interest boys more. 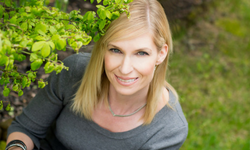 Hi Tanya, what an awesome site you have here! We have five children so certainly know the value of good toys! For sure there will be a toy for one of our children here, so I have bookmarked your site for future purchases. Love the layout of your site! Great work. Wow, you must really have your hands full with 5 children! 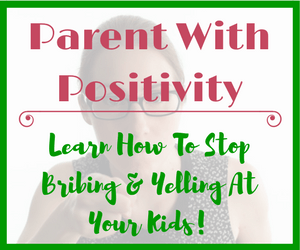 You probably already have most of the toys that I discuss, but hopefully some of the tips I share will be of use (depending on the ages of the children). I am just working on adding some toy guidelines to the site based on age group. So make sure you check back! Great Christmas gift list for toddlers. It so happens that my niece is turning 2 soon and I really like the idea of how a doll house can encourage vocabulary in children. We noticed that she has been a bit slow in picking up words, unlike her older siblings and she hasn’t even tried calling my name yet. We know she likes dolls and her sister always talks to her own sets of ‘people’ in her own doll house. Maybe she will mimic her sister if we get her one. That’s a good one to think about. A dollhouse would make a great gift for your 2 year old niece! If her parents interact with her while she is playing with the dollhouse it can really help with her language development! Another great gift for a 2 year old to help with language development (since it looks like her sister already has a dollhouse) would be a play kitchen. There are many smaller ones available if you don’t want something to big. I go into more depth about how play kitchens are great for language development here. It must be difficult buying toys for such young children. You have to buy things which are not dangerous to them, but which are still fun and imaginative. Also, I imagine that they quickly get bored with whatever you buy them because they grow up so quickly. That Working Trio toy looks good, though. Like you say, you can use it to help build up their vocabulary. That’s such an important thing, and if you can combine learning with fun then that’s the best scenario. Thanks Marcus! It really is difficult finding Christmas gifts for 2 year old’s, or any gift for that matter! There are literally thousands of toys available for this age group, each claiming to be the best and make your child the smartest. Parents can easily get sucked in. The key is to keep it simple. Children do not need much. And a 2 year old does not need a toy that will teach him/her academic skills. There is plenty of time for that! A unique collection of toys that develop our kids’ imagination and creativity! When my daughters were younger, I bought the Mega Bloks and they played for hours with it! I also like the Melissa and Doug Pattern Blocks, a toy that will develop their vocabulary. 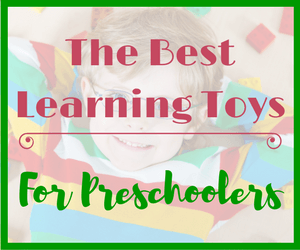 It’s great to mention how to use the toys in an educational way. Good article! Thanks David. I want parents/caregivers to know that there are so many ways that they can help their child learn language as well as other skills. Some toys lend themselves to this better than others. 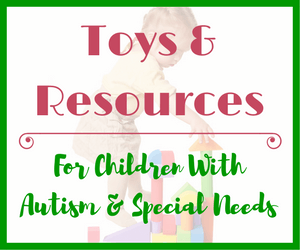 Personally I believe a child does not need many toys, as long as the toys they do have can be used in many different ways. My children used their Mega Bloks for building as well as for making cool patterns in playdoh! This is wonderful! I’m usually pretty bad with gifts, so this article saved me a ton of time! Mega Blocks First Builders sounds really good, especially because you can “upgrade” it with Duplo and Lego blocks later on. And they are good for boys and girls. I would like to ask though if the Mega Blocks are BPA free as well? To me this means that there may be trace amounts of BPA and PVC. The real issue for me with plastics where I would want something BPA free is if it will be heated.